How to Burn PS2 Games and Burn play station 2 Games? GAME CLONER helps you to burn PS2 games, Burn DVD Games or TV Games, whatever they are! 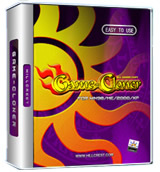 Game Cloner - Elaborately designed for multi-level game players and cloner, GAME-CLONER enables you to play and copy various kinds of games, Burn Play Station 2 Games, Burn PS2 Game, Burn PC games or TV games, Burn CD games or DVD games, Burn 3DO Games, DreamCarst Games, SEGA Saturn Games easily, whatever they are ! Read More Detail about Game Cloner! 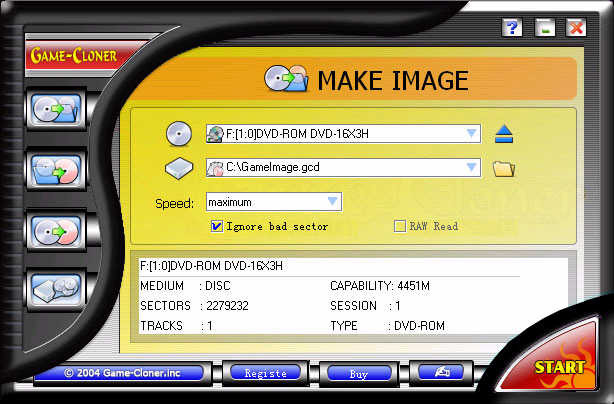 ---Game-Cloner is a kind of software that can back up a variety of CDs and DVDs (including video DVD and music CD, etc). Its main function include creating and burning image files, reading image files with virtual drive and disc to disc copy. Compared with other similar products, it incorporates all features of easy operation, high quality, high burning speed and so on. 2.How to register after payment? * Click Register button on the main panel and a Register page will pop up. * Fill in your register code and user name separately in the Register page and then click OK to proceed. * The Register and Buy buttons will disappear if you register successfully. And then you can enjoy the full function of Game-Cloner! 3.Should I pay any additional fee after registration for upgrading? ---The upgrading of the software is absolutely free for all registered users. 4.May I buy Game-Cloner with my credit card? Yes, of course. Paying by credit card is the most efficient way to get your register code. Please Click HERE to order Game-Cloner. 5.How long does it take to make a disk into an image file? And how about burning an image file and copying a disk? ---The above operating time depends on many factors, such as the speed of CPU , HD and CDROM,the size of disc, etc. Time needed varies greatly in different situations. For example, it took us about 15mins to 2 hours to read and create image files in the trail of cloning an 8G DVD movie, while 20mins to 1hour to burn the image files. 6.How to burn an image file into a disk? ---Click BurnImage icon to enter the image-burning page. Browse the image files you want to burn and select the burner you will use. Click start to burn. If there is no disc in DVD-ROM or the disc is not compatible, the DVD-ROM will eject automatically and inform you to insert a correct disc. 7.Does Game-Cloner support ISO format files? And how about other formats? ---Yes, Game-cloner supports ISO format files. Besides, it supports GCD, NRG and CUE formats. 8.Does Game-Cloner support the copy of D9 disks? ---Yes, it does. But if you want to back up a D9 disc, then you need a DVDR or DVDRW of D9 format to get enough capacity, for the capacity of other discs (such as D5) will not be sufficient and Game-Cloner cannot burn the data of one disc onto two different discs. 9.Does Game Cloner back up game disks only? ---No. Actually, besides game discs, Game-Cloner supports nearly all the other discs on market, such as CD-XA (DDCD), VCD and DVD etc. You can back up digital discs, music CDs and movie discs with Game-Cloner. 10.What kind of CD protection does Game-Cloner support? ---LaserLock , CD-COPS , DiscGuard , Star Force , Dummy files , PS2,etc. Backing up some protected CD needs assistant tools. 11.Can I copy DVDs with Game-cloner? ---Game-cloner is able to copy DVDs which are not copy protected and which are 4.4 GB in size, such as is supported by DVD-R or DVD-RW media. 12.What is the purpose of the virtual cdrom of the Game-cloner ? ---The Game-cloner program creates some extra drive letters in your Windows Explorer. Once created, you can treat this drive as if it was a normal CD: You can read its data, copy data from it to your hard drive or launch a program from it. 13. Does Game-cloner support XBOX Game discs' copy? ---Game-cloner can not copy XBOX game discs. GAME-CLONER V1.15 is officially issued ! GAME-CLONER V1.15 is officially issued . DVD Cloner II - is a genuine DVD copy software, includes the CSS decryptor support Copy-Protected DVDs! perfect 1:1 DVD Copy without water mark and warning screen, State-of-the-art dvd burners compitable and Dual Layers 8.5GB DVD+R supported, DVD 9 to DVD 9, DVD 9 to DVD 5 copy is super easy ! Just try it.